Neuroradiology uses X-ray, computed tomography (CT), ultrasound, MRI and positron emission tomography (PET) technology to find and diagnose abnormalities of the brain and nervous system, head, neck and spine. These imaging technologies help our neuroradiologists to diagnose strokes, brain malformations, tumors, aneurysms, Alzheimer’s disease, spine disease, vascular disorders, and other genetic and neurological conditions. Early diagnosis for conditions such as these is crucial to helping the treating physician begin the patient’s needed therapies as soon as possible. 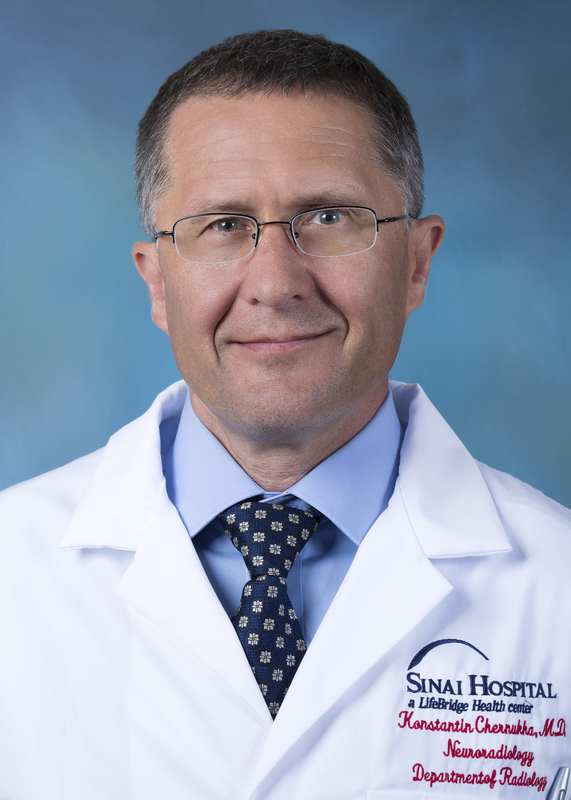 Konstantin Chernukha, M.D., is a radiologist for LifeBridge Health, where he specializes in diagnostic radiology and neuroradiology. Dr. Chernukha received his medical degree from the Moscow Institute of Medicine & Dentistry. He then completed a clinical research fellowship at the Allegheny Singer Research Institute's Department of Neuroscience Research. Following that, Dr. Chernukha completed a surgical pathology residency at the University of Pittsburgh Medical Center and a diagnostic radiology residency at Case Western Reserve University in Cleveland. He also completed a fellowship in neuroradiology at the Indiana University Medical Center. David S. Moss, M.D., is a radiologist for LifeBridge Health, where he specializes in neuroradiology and body imaging. Dr. Moss received his medical degree from the University of Maryland School of Medicine. He completed an internship in medicine at the Booth Memorial Hospital in New York, then residencies in radiology at Sinai Hospital in Baltimore and the Mt. Sinai Medical Center in New York City. He also completed a fellowship in abdominal imaging at Columbia Presbyterian in New York and a fellowship in neuroradiology at the UMass Memorial Medical Center. Schedule an appointment for neuroradiology today.